Your feet are the base that your body stands on. If your feet are weak or have structural problems, this can lead to problems in your knees, hips and low back, and can even cause headaches. Many people wear orthotics because they are good for their feet, but orthotics are even more important for those who experience pain after extended walking or standing. The most popular brand of orthotics is Foot Levelers. Foot Levelers, Inc. has been in business for over 50 years. When ordering orthotics, a cast or mold will be made of each of your soles. Some doctors have started to use high tech digital scanners. 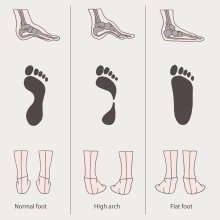 At least 16 different measurements of your feet are taken to ensure that your feet, and therefore your foundation, are more firmly supported. Please note that the orthotics and insoles that you buy at your drug store are not the same as the high quality orthotics that you can have custom made, even though they look similar. Insoles may effectively reduce pressure by increasing the padding under your feet, but orthotics are customized and provide a foot-bed that is molded specifically for each of your feet based on their unique shape and size. Customized orthotics are also a worthy investment. Ask us whether we think you need orthotics or not.